I have for over 50 years been taking photos .I would place myself in the enthusiast pigeon hole. Over the years I have used various digital software, of course most of my photographing life digital processing did not exist, and now I manage my collection of photos with Adobe Lightroom 5. Whilst away from home I like to review photos, maybe post-process, and then rename and add keywords. For this purpose I use my MacBook Pro, and by exporting the new photos as a catalogue and then importing into my main system on iMac. However if I am travelling light, usually on walking trips or short breaks I use my iPad (Air 2). Synchronising this with my iMac involves more work to setup, but once this has been done is quite simple. I do not use Lightroom Mobile because in my experience it works the reverse to what I want in that you can work offline on your photos already in Lightroom, and even edit them, but not do the categorising and renaming. Note While travelling I tend to shoot in JPG so this works for me. Raw images will not work using this as the iPad will only use a much reduced size JPG version of RAW (I think?). When travelling I normally leave the Sony A65 at home. The remaining cameras all have wifi ability so that I can transfer the photos to the iPad. The Sony NEX-6 and the RX100 generate their own wifi so the transfer of photos can be done at any location, not requiring an existing wifi and/or internet connection. If I do have A65 I can put SD card into RX100 and transfer to iPad. I review photos in standard IOS Photo App, deleting rejects. I then add the remaining to an Album which I have named WIP. These I edit using PhotoGene App, which has a good range of editing features but also the ability to update IPTC where I add Keywords, Title, and other data. The completed photos can then be shared to various places, I may send them direct to Flickr but all are exported back to Photo App, so there is now the edited version and the original. I have followed the instructions of Adam Portillo (see below) so that after a short time all of the photos added to my iPad whilst away will be seen in my Lightroom in a folder I have named Auto Imported Photos. From here I can do any further processing if required, either on original or on those edited on iPad. Typically I use the LightRoom facilities to send selected photos to Flickr. Backup independent of my home. Access when away from home. I can embed in web pages I develop. The fact I receive some feedback and even the very occasional request for publication is just a bonus. This collection of almost 10,000 photos is the consolidation of the above mentioned software packages. Ability to download your videos in their original quality and full length (beyond the 3 minute play limit). 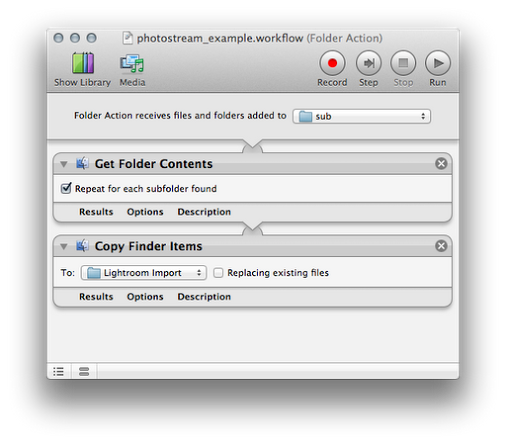 Create an Automator folder action to copy all files added to your hidden Photo Stream folder to a folder elsewhere on your computer. Add a 'Get Folder Contents' action to your workflow, being sure to check the 'Repeat for each subfolder found' option. Add a 'Copy Finder Items' action to your workflow, selecting a folder where you'd like Lightroom to import from. Something like "/Pictures/Lightroom Import" might be a good idea. Save your workflow. You've just activated an Automator action that copies new Photo Stream images to a folder of your choosing. Tell Lightroom to automatically import images from this folder. In the Lightroom menu go to: File -> Auto Import -> Auto Import Settings... This will move the files out of the folder you just created and into Lightroom, leaving the hidden photostream directory un-modified so that we don't confuse iCloud or prevent you from viewing your Photo Stream on other iOS devices. There is no step 3. Just go out and take some awesome photos. Next time you launch Lightroom, they'll be there, and your images will continue to be imported on the fly when Lightroom is open. I use the wifi capabilities of Sony to download the days photos to my iPad, deleting rejects and adding ones I want to keep to iPad album I call WIP. Switch to Photogene App and open WIP folder. Rate, add tile and keywords. Export to iPad Camera Roll. Note you can also export direct to other services such as Flickr and DropBox. Lightroom Auto Import. Note the original files are also imported so you can start again using Lightroom and Photoshop. Rename files so that name is prefixed with date and then title added to end and rename the original so that it has the same name but with "original" added to it. I copy the metadata from the edited file to the original. Note to do this right click on the thumbnail and select Metadata Presets not Metadata. 8.This photo was edited with Photogene on iPad.